You’re on your way to work and you find yourself wondering how did I get here? The job you thought was going to be so great has become so laborious you find yourself wanting to turn around and go home, to get back in bed, to pull the covers over your head. Your boss, your to- do list, even some of your team mates are sucking you dry. This is not where you thought you’d find yourself. Where do you even start when you don’t know what you want to do? Do not do what most people do! Most people will start idly scrolling through job postings online! This is one of the most disheartening things you can do to yourself. I say this because I hear it all the time. Most people will spend way too much time reading job descriptions, focus on the one or two things they aren’t qualified to do, and decide there’s nothing out there for them to do. You find yourself searching job titles and using key words that are close to what you’ve been already been doing and every job looks dry, dull and exhausting. But here’s the thing. We know that what you’ve been doing isn’t necessarily what you want to do next! You know that saying, insanity is continuing to do the same thing but expecting new results. The most important thing to do when you hit this inflection point of career disappointment, is to stop, take some slow breaths to genuinely calm down, and ask yourself these important questions. 1) What have I most enjoyed and felt most proud of in my life? 2) What’s missing in my day-to-day life that I’m longing to have more of – work or otherwise? 3) What would my ideal day/job/lifestyle look like? Taking time to reflect on these questions will undoubtedly deliver useful insights. If you want to dig deeper use my free downloadable list of questions to spark and deepen your career clarity. Anyone can benefit from these questions – new graduates launching their careers, mid-career folks who have hit a road block or have had other life circumstances create major changes, or those of you who are finding your career path changing because of new technology or changing market conditions. 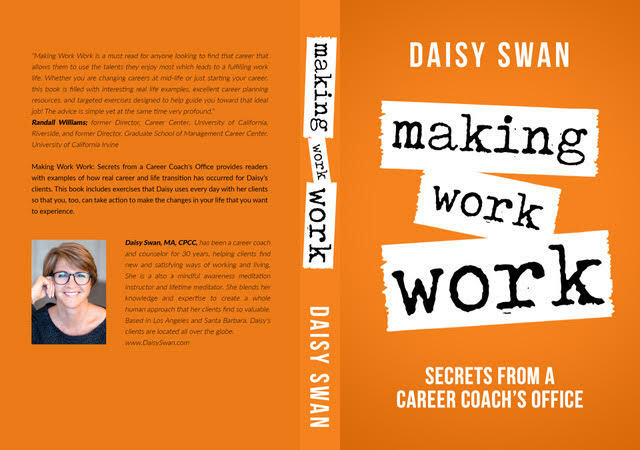 You can also download my ebook Making Work Work: Secrets from a Career Coach’s Office which shows specific examples of how I’ve worked with, and successfully helped, clients facing all kinds of career challenges to make powerful changes in their lives. You don’t have to stay stuck! And you don’t have to work on these changes alone. 2019 is fast approaching. Get started now with new perspective and self-knowledge and you’ll be off and running into a bright New Year!